I am also trying to get the Lyric T6 working. I do get a card in the frontend, but this is on 0.74.0 which had some Homekit fixes, so maybe that was key to getting the card. However the card is only showing “Unknown” instead of the temperature. I have been playing with the HomeKit component that is used by Home Assistant (https://github.com/jlusiardi/homekit_python) and with the commands from the readme I am able to get all the info from the Lyric. So it seems to be something in HA. My guess is that it is related to the fact that in the HA logging it shows “supported_features”: 0, so maybe HA thinks the device does not support Temperature? Or maybe HA is just not polling the device? Getting more logging or another way to debug would be nice. Just upgraded, and have the exact same situation as you’re mentioning. I’ll take a deeper look when I’ve got some time. Possibly we can report this as an issue in github? I have been unsuccessful at getting my two T6 Pro(s) to connect to my hass.io setup. Updated and saw the new Climate card saying “unknown” and without much info. I might end up just adding the thermostats to the Home App and try and integrate them into HA from there. Initially I was trying to primarily use the Home App and integrate third party devices with HA, but have shifted more towards using HA and then just voice control with Siri. It’s been a long battle lol. Would love to see Honeywell Lyric thermostats integrated with HA. 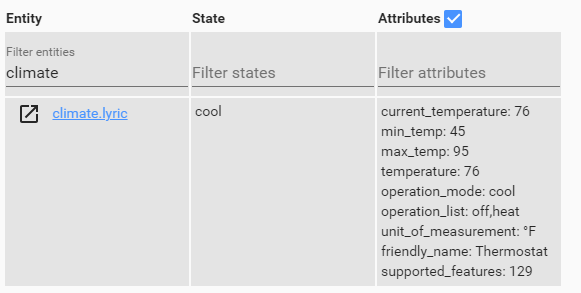 Honeywell has a well documented API to access the thermostat. I will be happy to work with you on this. I have the thermostat and can also test it out for you. Had a little time to test, got some more info, HA is actually detecting it as a thermostat! On first look it seems like the accessory info is getting lost or badly imported. Update: with some changes to climate/homekit_controller.py tthe T6 is functional! Check the posted github for more info. Support for Homekit climate devices. I’ve tried a number of configs to get this going as a custom_component with no luck. The controller/component docs aren’t helping. I got this set up and added a lovelace entity card. Everything appears to report properly until I make a change through the card. The card never updates with the temp I set. The actual lyric does change to the new temp but also sets to "away’. Here, I’ve set the temp via the card to 74, but hass.io doesn’t get it. Just wanted to edit my original post and say that I was able to add my two T6 thermostats via Homekit_Controller. I realized I was missing the “custom_components” directory, so I just made the folders and then made a homekit_controller.py file in Atom (I use macOS). I restarted HASS.io and the Climate card was updated. I noticed only “off” and “heat” were there, but customized the entity and added “cool.” This fixed it nicely! Glad to see the progression! The only thing stopping from using the HA app full time (instead of Home app) is that I couldn’t get the HomeKit key to work for (1) eight Leviton HomeKit switches and (2) two Honeywell T6 thermostats. With these climate and switches/lights working, I can use HA full time (which I wanted specifically due to better radius control of my zones. @gohassgo I don’t use lovelace. It could have to do with the fact that your t6 can run HVAC and not just heat as i can see on your attributes. Any tips on getting these thermostats to reappear into the Home app? 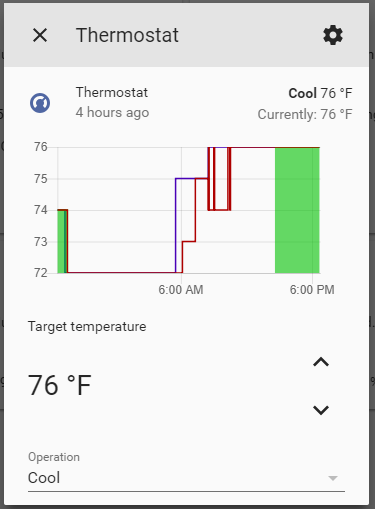 I have my alarm and also garage door showing up in the Home app still, but the thermostats have been gone since I reset them and added them to HA. When I go to add an accessory in the Home app, nothing appears. I have also tried disabling the Homekit component, which did not help. Any ideas? I would like to retain the functionality of the Home app integration into iOS. Thanks for that… I added “cool” to the entity in Configuration > Customization > operation_list. The cool mode does appear in the card, but temperatures are not updating and always shows 76. However, the history graph does show temp changes and it looks correct. Any idea why the temps aren’t updating as they should? Let me say thanks again for all the help and effort. I do use Homebridge for security cameras to show up in Home app. I am not sure if I would need a generic climate plugin or a specific Honeywell to get it to show up. Homekit component works fine for my garage (cover) and alarm (alarm_control_panel), and should also work for climate. However it simply does not appear when I add it in the Home app. Hopefully someone can chime in if they figure out how to do it. Same issue as @gohassgo, is like they stopped reporting updates to Home Assistant or Home Assistant stopped polling them (I have 2 T5s). After a restart my two T5 disappeared. They are no longer being detected by Home Assistant. Any idea?